He is a software engineer and landed a job many dream of. But a handsome salary and a life of luxury did not fascinate Vaibhav Desai. While working at Godrej Infotech as a programme analyst, Vaibhav wanted to contribute his bit to environmental conservation. Being a cycling enthusiast, Vaibhav decided to indulge his passion to promote the cause of the environment. He began to cycle to create awareness about global warming and climate change. Vaibhav began his cycling expeditions in June 2008 with a month-long tour from Mumbai to Ladakh and back. “I always loved to travel and cycling has been a passion since childhood. Global warming and climate change being the most important concerns of the time, I decided to use cycling to create awareness in the general public,” says Vaibhav. The Mumbai-Ladakh expedition was followed by Mumbai-Kanyakumari expedition in January 2010 and a 12,000 km, ten month-long green earth expedition starting December 2010. He is still is on the payroll of the company he joined in August 2008, but is on a leave without pay. Cycling has been Vaibhav's enjoyment since childhood, and he began the expeditions for the sheer pleasure it gave him. There was no objective in the beginning. “My journeys and expeditions were begun only to explore the country and learn about different communities and cultures. During the expeditions, I learnt that people living in rural areas are much more aware about the environment than their urban counterparts,” says Vaibhav. His ideas began to take shape when he learnt of the dangerous developments and the environmental degradation they were causing. “Cycling expeditions are my bit of contribution to the cause,” he adds. Vaibhav now has decided to tour three continents—Central Asia, Europe and Africa. Before going on the inter-continental expedition, Vaibhav has plans to tour the length and breadth of India. The expedition would take one-and-half years to complete beginning this month. “This expedition would be preparation for the inter-continental expedition which I am planning to start in January 2014,” says Vaibhav. At present, he is preparing for the India expedition as well as raising funds for the inter-continental expedition. It will be a three year expedition. I am taking into account various factors like socio-political situation and weather conditions while finalising the route, he adds. Recalling the reaction of family and colleagues, Vaibhav says, his parents have always been very supportive and encouraged him on every expedition. So did his organisation, which took him back on its pay roll so that he would have a job as a backup. 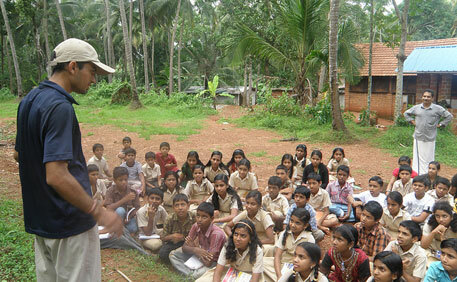 Homi Daruwalla of Godrej and Boyce E and E division provided the initial funding to start the expeditions. At present he is trying to raise funds for the long haul ahead. His main mission is to explore and document sustainable activities, both at the micro and macro level. During his expeditions, he also shares his experience with local people and students to inspire them to act to protect environment. “Sharing experience from different parts of the country with a variety of people helps in changing their perception and motivates them to work for environmental protection,” says Vaibhav.